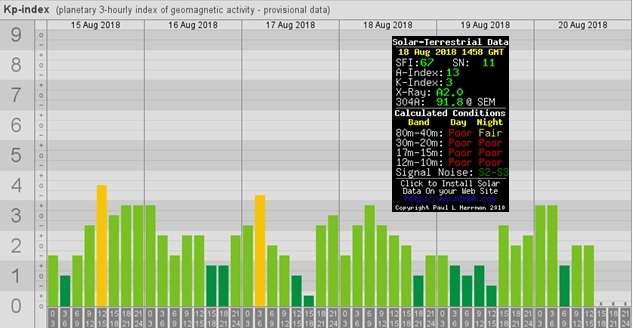 It seems like even small bumps in geomagnetic activity are ruining HF radio propagation for me this summer. Beware a K Index more than 2! During early August, shortwave listening conditions were pretty good. But, everything changed on August 15th. Geomagnetic activity increased slightly. I found that made a big difference and not a good one. As you probably know, the latest solar cycle has been a big disappointment. Recently, very few sunspots have been available to boost ionospheric propagation. But still, you could find enough to listen to on most frequencies below 20 MHz. I have been noticing, though, that even small disturbance in the Earth’s magnetic field can punish HF propagation. Geomagnetic activity refers to natural variations in magnetic field surrounding our planet. Variations are caused by low-energy particles streaming from the Sun. Major drivers are coronal mass ejections and high speed solar wind. During these disturbances, particles tend to concentrate in polar regions where magnetic lines of force are closer together, and these concentrations effect the ionosphere’s chemistry. Scientists measure the severity of geomagnetic activity with the K Index (logarithmic scale 0-9) and A Index (linear scale 0-400). For us shortwave listeners, quiet conditions are preferred, with a K below 2 and an A below 5. Anything higher, and the field becomes unsettled or stormy. You can track recent K indices easily online. The picture above shows K Index between August 15-20. While we did not experience any storms, most readings are unsettled or active, more than our ideal “quiet”. So, how is our shortwave listening impacted when the K Index moves above 2? Generally, F layer MUF gets depressed, as do we! You will find that severity and duration of geomagnetic activity depresses MUF more. Higher frequencies and long paths go quite dead. It often takes a day or more for solar winds to bring increased particles to Earth, and a few days to recover once the geomagnetic field goes quiet, again. Effects on propagation are most pronounced over polar paths and within higher latitudes. You will notice expansion of the auroral oval and brighter “Northern lights”. Also, absorption of radio signals increases, leading to Arctic flutter (scintillation) and often total absorption. You will notice other effects from increased geomagnetic activity including higher atmospheric noise. On the other hand, trans-equatorial propagation may actually improve. Most of the signals I listen to in western Canada travel great-circle paths over the polar region. During August 15-20, these signals pretty much disappeared. Reception from stations in New Zealand and Central/South America were not affected. Here on Earth, strong geomagnetic activity induces electric currents in long conductors. You may not know this, but high K Index results in power grid voltage fluctuation. Also effected are long telephone and telegraph transmission lines. Even pipelines in the ground build up currents that can effect normal operations (flow of fluids) and SCADA systems. GPS reception may become intermittent as radio waves scintillate or flutter down to Earth. Spacecraft orbits may degrade because of heating in the upper atmosphere. Sharp changes in geomagnetic activity can even effect human regulatory systems. You can read more about the impact of geomagnetic storms here.